It may surprise you to note that Coventry Diocese has only existed for one hundred years. It was not till then that the then St Michael’s Church, became a cathedral, the cathedral that went on to be destroyed in World War 2. Now the new cathedral stands as a symbol of hope and reconciliation, which was a key theme of last weekend’s celebration of the centenary of Coventry Diocese. Many celebrations took place throughout the day in the sunny ruins of the old cathedral, moving into the new cathedral for a memorable service where communion was set out like the feeding of the 5000! Why is this significant to Our School? The Willows is one of a small number of International Cross of Nails schools in the Diocese. Over the next few months, this cross will be carried from school to school and church to church across the Coventry diocese. So the cross of nails will be coming to us in June. 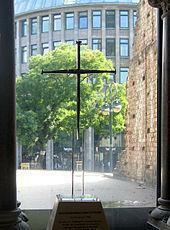 This cross, a symbol created from the ruins of the cathedral, is a symbol of hope, rebuilding and reconciliation. The building of the cathedral reminds us of the phoenix rising from the flames, an image now depicted on the Coventry flag.